First Pre-Order allocation has been sold out. This is for 2nd Production. This is PRE-ORDER. Your order will be shipped once we receive Pre-Order items. 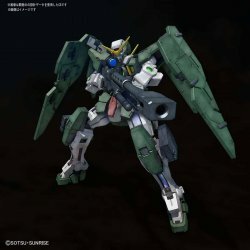 From "Mobile Suit Gundam 00" Gundam Dunamés finally appears in MG with completel..
From "Mobile Suit Gundam 00" Gundam Dunamés finally appears in MG with completely new modeling! ■ Expanded the stand of the GN Sniper rifle, you can reproduce the "sniper" stance that puts the body down on the ground. ■ Head gimmick corresponding to the movement of snipe pose, you can reproduce the tense feeling drift due to the joint structure of the leg. ■ Reproduce the development of GN full shield.